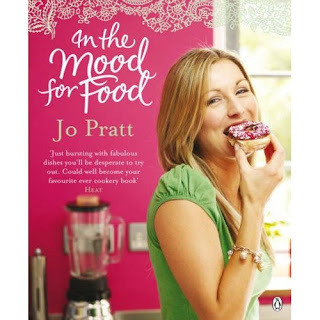 I'm a huge fan of Jo Pratt despite not knowing who she is until very recently. Books are horrendously expensive in New Zealand so the library was my main source for reading materials. However, now that I'm in the UK and only a click away from the world's biggest online bookstore, Amazon, I've been busy trawling the site for cookbooks. 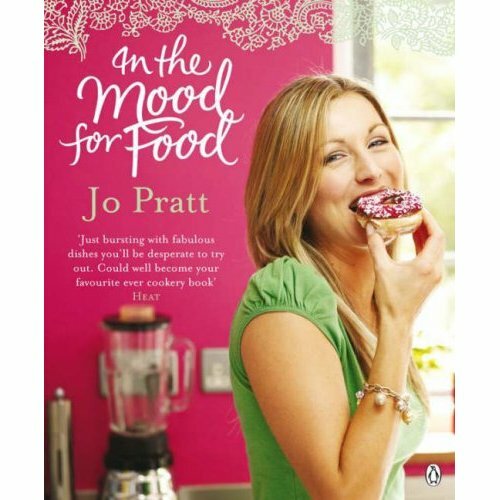 I fell in love with Jo Pratt's "In the Mood for Food". All the recipes are simple, easy to make and utterly delicious. I've tried her Coconut and Raspberry cakes here and they were divine. I've made her chunky chocolate cookies a couple of times and L and her friends polished them all. She has requested a new batch minus the nuts. 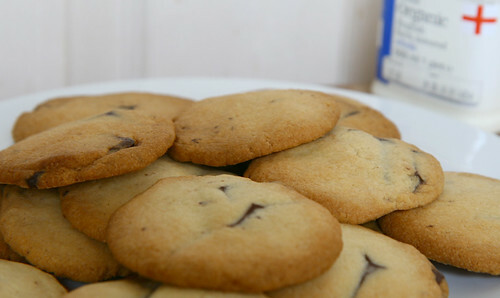 I'm sharing the original recipe but I made these with chunky dark Lindt chocolate (70% cocoa). The most delicious vanilla scent wafted through the flat whilst the cookies were in the oven. Voila! 12 minutes later, they're ready to be eaten albeit a little too hot. 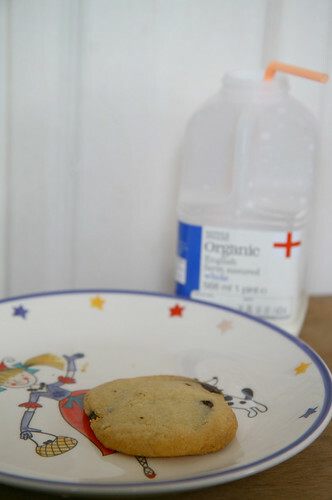 For her Royal Highness Princess L. Cookie must be served on a princess plate but milk must be served in its plastic bottle. I cease to understand the logic of a 4 year old. Makes about 12 and takes 20 minutes to make. Preheat the oven to 180 C/fan 160 C/ gas 4. Beat together the butter and sugar, until it is pale and creamy, either in an electric mixer or, if you are feeling energetic, by hand. Beat in the vanilla extract and egg yolk. Add the flour, white chocolate chunks and chopped nuts. 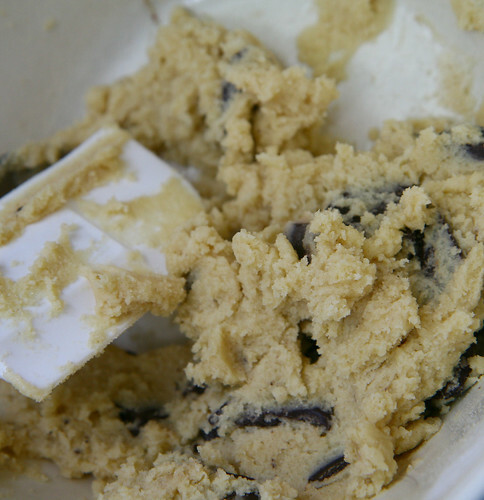 Mix until you have a smooth dough, with the only lumps being the chocolate and nuts. 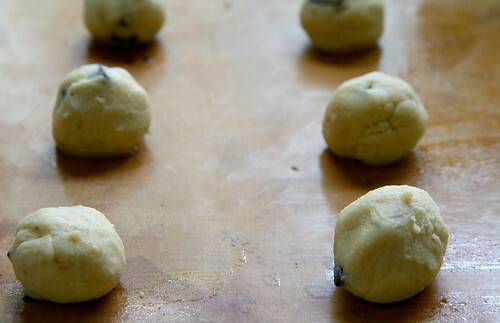 Using your hands, roll the dough into golf sized balls and lightly press each one flat on to a greased baking sheet, making sure they are spread slightly apart. Bake for 12 minutes until golden. 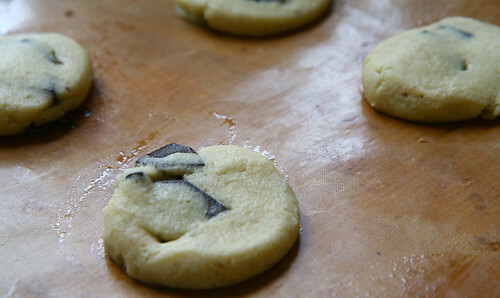 Remove from the oven and let cool for a couple of minutes before either eating or cooling completely on a wire rack. and a demanding diva too!